Those pictures are adorable! Happy Father's day to Bryan! Those are the cutest pictures ever...and the captions! I love coming here for a good read and a laugh. Thanks for brightening my day, I hope you guys had a wonderful Daddy's Day!! Haha! When our daughter was a freshly minted 1 yea rold we remodelled our bathroom, too. 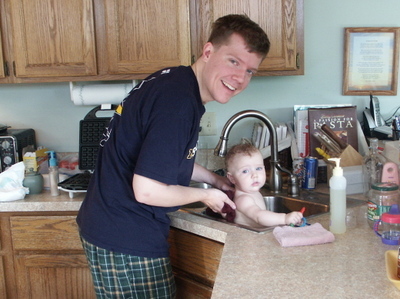 We also have the kitchen sink-bath pictures. And when she was 8 months old she crawled under her playpen, depite me repeatedly telling her that she was going to get sdtuck (because 8 months olds listen, right?) When she was stuck and wailing under playpen I got the camera and took a picture, just so that 20 years from now I could tell her "I told you so!" Your pictures are bringing back great baby memories for me! Such a cutie! And your captions are funny. We used a kitchen sink at my parents' house - it worked great! Ha ha ha! 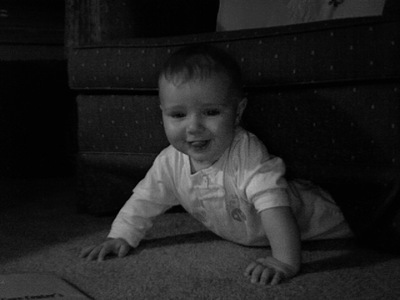 My daughter used to back herself under chairs too! We laughed at her and felt no shame. (Of course, we freed her promptly.) Actually, it was one such instance that led to her sitting up by herself the first time: she backed herself against a wall, and eventually backed herself into a sitting position! Which severely weirded her out. 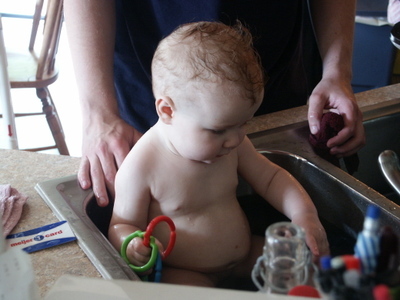 my cousin used to bathe all of her babies in the sink - it was easier on the back she said. She is so cute in that sink! 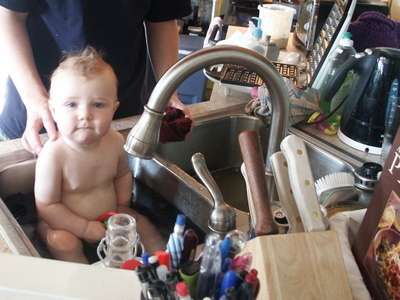 My grandmother has pictures of each of her nine grandchildren taking baths in her kitchen sink. My parents have pictures of us doing the same. 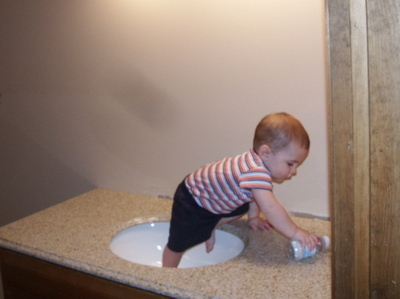 My favorite is of my brother trying to drink from the running faucet. I did some sign language with my daughter to ease that frustrating time when they can't talk, but want to ask for something. I waited until she was a year old and showed her a few signs. She only needed about 5 signs to do the job: bottle, eat, drink, more, music. She really liked the sign for shoes, they tend to pick up signs they like. If I knew she wanted her music on and she was pointing and whining, I'd have to ignore any whining for music and demonstrate the sign and wait until she used the sign. She caught on quickly and the whining went away. It was beautiful! Its up to you. Its not going to matter much one way or another. Three years later, she remembers not one sign.